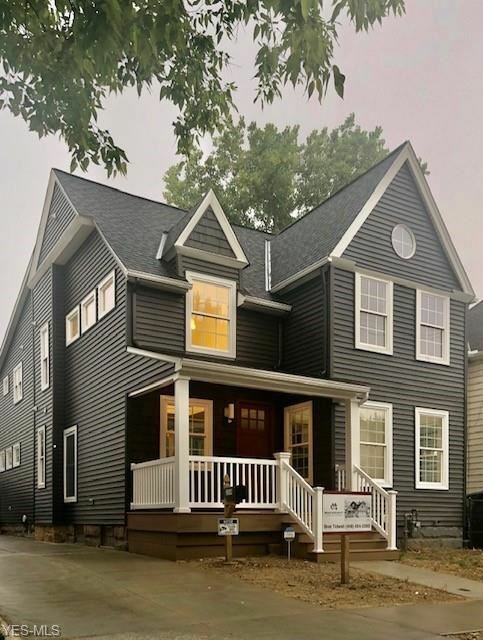 Complete rehab of this charming 2 story Colonial. Home will feature inviting front porch, open floor plan of Morning Room, Kitchen, and Great Room, large Mud Room, second floor Master Bedroom suite, double sink vanity in Bath, plus one more full Bath, walk-in closet, large 4th Bedroom and Bath on 3rd floor. 2 car Garage. Adlai Stevenson School Pre-School, Elementary School, Middle School / Public 1 9.88 mi. Andrew J Rickoff Pre-School, Elementary School, Middle School / Public 1 8.29 mi. Anton Grdina Pre-School, Elementary School, Middle School / Public 1 5.09 mi. Artemus Ward Pre-School, Elementary School, Middle School / Public 2 4.21 mi. Benjamin Franklin Pre-School, Elementary School, Middle School / Public 3 4.14 mi. Bolton Pre-School, Elementary School, Middle School / Public 1 6.19 mi. Carl & Louis Stokes Central Academy Pre-School, Elementary School, Middle School / Public 1 4.33 mi. Case Pre-School, Elementary School, Middle School / Public 1 4.46 mi. Charles A Mooney School Pre-School, Elementary School, Middle School / Public 2 3.76 mi. Charles W Eliot School Pre-School, Elementary School, Middle School / Public 2 9.05 mi. Clara E Westropp School Pre-School, Elementary School, Middle School / Public 2 5.99 mi. Daniel E Morgan School Pre-School, Elementary School, Middle School / Public 1 6.25 mi. Denison Pre-School, Elementary School, Middle School / Public 2 2.85 mi. East Clark Pre-School, Elementary School, Middle School / Public 2 9.53 mi. Euclid Park Elementary School Pre-School, Elementary School, Middle School / Public 2 10.67 mi. Franklin D. Roosevelt Pre-School, Elementary School, Middle School / Public 1 7.49 mi. Garfield Elementary School Pre-School, Elementary School, Middle School / Public 3 3.6 mi. George Washington Carver Pre-School, Elementary School, Middle School / Public 1 4.49 mi. H Barbara Booker Elementary School Pre-School, Elementary School, Middle School / Public 1 0.8 mi. Harvey Rice Elementary School Pre-School, Elementary School, Middle School / Public 1 6.98 mi. Iowa-Maple Elementary School Pre-School, Elementary School, Middle School / Public 1 8.47 mi. Joseph M Gallagher School Pre-School, Elementary School, Middle School / Public 1 0.37 mi. Louis Agassiz School Pre-School, Elementary School, Middle School / Public 2 2.44 mi. Louisa May Alcott Elementary School Pre-School, Elementary School / Public 5 0.99 mi. Luis Munoz Marin School Pre-School, Elementary School, Middle School / Public 1 2.4 mi. Marion C Seltzer Elementary School Pre-School, Elementary School, Middle School / Public 2 0.79 mi. Marion-Sterling Elementary School Pre-School, Elementary School, Middle School / Public 1 3.85 mi. Mary M Bethune Pre-School, Elementary School, Middle School / Public 2 7.4 mi. Memorial School Pre-School, Elementary School, Middle School / Public 2 10.29 mi. Nathan Hale School Pre-School, Elementary School, Middle School / Public 1 6.95 mi. Patrick Henry School Pre-School, Elementary School, Middle School / Public 1 7.77 mi. Paul L Dunbar Elementary School @ Kentucky Pre-School, Elementary School, Middle School / Public 3 1.13 mi. Robert H Jamison School Pre-School, Elementary School, Middle School / Public 1 8.57 mi. Robinson G Jones Elementary School Pre-School, Elementary School, Middle School / Public 3 5.02 mi. Scranton School Pre-School, Elementary School, Middle School / Public 2 2.22 mi. Sunbeam Pre-School, Elementary School, Middle School / Public 1 7.1 mi. Thomas Jefferson School Pre-School, Elementary School, Middle School, High School / Public 2 1.53 mi. Wade Park Pre-School, Elementary School, Middle School / Public 1 5.74 mi. Waverly Elementary School Pre-School, Elementary School, Middle School / Public 2 0.71 mi. Wilbur Wright School Pre-School, Elementary School, Middle School / Public 2 2.12 mi. William C Bryant Elementary School Pre-School, Elementary School, Middle School / Public 2 4.33 mi. Willow School Pre-School, Elementary School, Middle School / Public 1 4.29 mi. Willson School Pre-School, Elementary School, Middle School / Public 1 6.35 mi. Almira Elementary School, Middle School / Public 1 2.83 mi. Charles Dickens School Elementary School, Middle School / Public 1 7.79 mi. Clark School Elementary School, Middle School / Public 6 1.18 mi. Collinwood High School Elementary School, High School / Public 2 9.7 mi. Fullerton School Elementary School, Middle School / Public 2 5.05 mi. Mary B Martin School Elementary School, Middle School / Public 1 5.82 mi. Miles Park School Elementary School, Middle School / Public 1 6.49 mi. Riverside School Elementary School, Middle School / Public 3 3.34 mi. Walton School Elementary School, Middle School / Public 2 1.87 mi. Whitney Young School Elementary School, Middle School, High School / Public 6 9.86 mi. East Technical High School High School / Public 2 4.59 mi. Garrett Morgan School Of Science School High School / Public 2 1.2 mi. Glenville High School High School / Public 2 7.76 mi. James Ford Rhodes High School High School / Public 1 3.76 mi. John Adams High School High School / Public 1 7.34 mi. Law & Municipal Careers @ Mlk High School / Public N/A 5.42 mi. Lincoln-West High School High School / Public 1 2.18 mi. Max S Hayes High School High School / Public 1 0.99 mi. The approximate monthly principal & interest payment for this property would be $2,564.30. This payment is based on a 30-year loan at a fixed rate of 4.000 % - APR 4.081 % with a down payment of $27,995. Actual lender interest rates and loan programs may vary. Loans with lower down payments are available. 1334 W 76th St, Cleveland, OH 44102 is a 4 bedroom, 3.5 bath single family home offered for sale at $559,900 by Deb Chandler in the Rocky River real estate office.